When my family moved to Livermore in 1992, we relied on newspaper listings to find valley homes decorated with holiday lights my family could visit and admire. The local newspaper, which listed the street addresses of "decorated homes" was helpful but many times we would get lost or, worse yet, stumble on a "stinker". What may be excellent and beautiful to me may not be for the next person, I thought. People sometimes nominate their neighbor or themselves just for the heck of it - just to see their address in the newspaper. So, what I thought people needed were maps and pictures to determine for themselves which houses were worth a visit. With that idea in mind and 20 hours (initially) of work, I created Lights of the Valley (lightsofthevalley.com) and published it on the World Wide Web December 11, 1999. Below is a brief history of the Lights of the Valley website along with my philosophy about how I select photos for this site. This website is compiled from homeowner & website visitor tips. Most were confirmed by homeowners this year; several were not because phone numbers or email addresses were not available. I rely on the public or homeowners to send additions or omissions. I like to have photographic evidence of an impressive display before I add an address to the website. Once completed, I sent out an email to about 25 people I knew in the Tri-Valley to announce the site and within 24 hours I was getting visits from as far away as Australia and Japan – which showed the power and speed of the Internet in action. 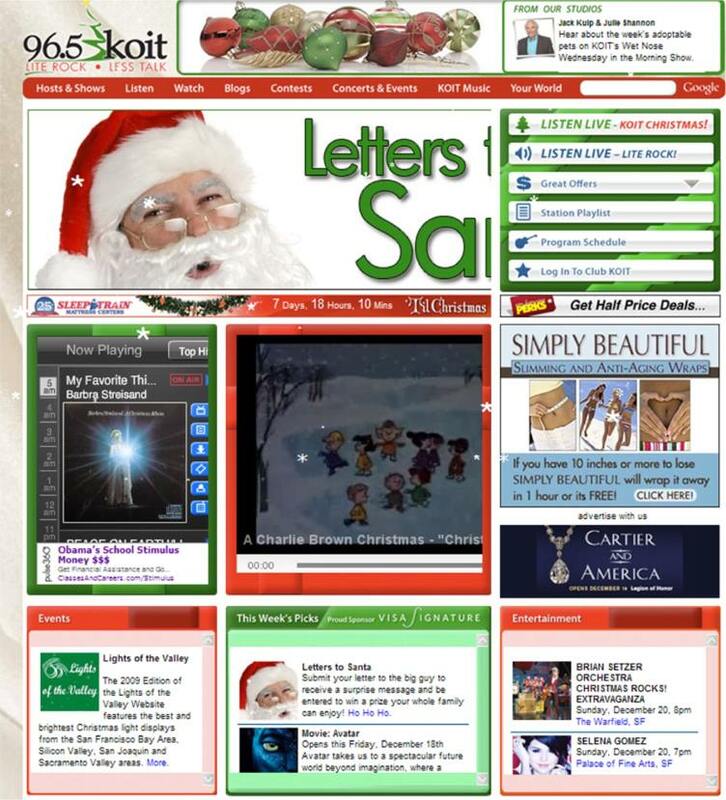 KKIQ radio promoted the site by talking about it for several days running, and the local newspapers included the URL as a part of their decorated homes lists. I originally started with about 30 homes in Livermore and Pleasanton on the Web site. Some features of the site included the ability to click on small photos of the houses to yield a larger view, while addresses below the "thumbnail" images provided links to on-line maps. Some of the original images included cartoon characters on Leland Way and on Candy Court in Livermore. There were the animated figures of Bob's World on Calle Reynoso in Pleasanton. And of course, I had to include valley fixture Deacon Dave's home. In 1999 his home had 193,000-lights (over 210,000 for the 2001 season). Two years before, PG&E installed a special power transformer for Deacon Dave, just so he could power all those lights without using multiple gasoline generators. For the 2000 holiday season, the site started off with over 40 homes, including new listings in Danville, Dublin and San Ramon. Tracy joined us on December 12th of that year. 5499 users. 2003 starts our site with a complete make-over. We got rid of the frames we were using & started to use a decorative template, rather than the plain vanilla white pages. Why? Well, as more and more people access the Web with broadband, we can fancy up the site a bit without making them wait too long to download it. We also pared down our list to 75 homes. Many of those reductions are attributed to homes that were never verified as being decorated last year. This year we added homes in Martinez, Clayton and Walnut Creek. Our record so far - 36679 users. 2006 marks our 8th year of providing this community service website. This year we added Sunnyvale, San Lorenzo, San Leandro, Palo Alto, Alameda and San Jose to the ever growing list of communities listed on Lights of the Valley. The site has become really popular, creating several new records for usage: December 23 had 2,296 unique visitors, creating 339,839 hits and downloading over 845 MB of images and data. 2006 was our 2nd best year - 2003 still has the record # of users. 36,330 users. We ended the year with 122 houses in 32 communities and 6 counties. 2007 represents a new era in Lights of the Valley. The third complete overhaul of the website with dynamically displayed, database driven pages. At the end of last year we searched high and low across Northern California for other homes that would "qualify" for a coveted spot on the Lights of the Valley website. We start this year with almost 300 homes - yes, more than double from the year before - in 69 communities and 14 counties! We also added a "House of the Day" feature so that "hand chosen" houses from the database are automatically displayed as the House of the Day between November 23 and January 1. Then we made that process even better. 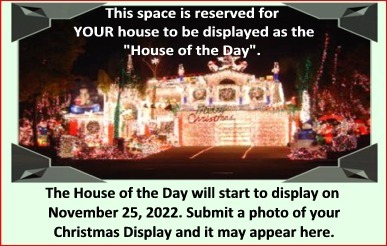 We created a special page and some coding so that anyone could use one line of code from our site and display a thumbnail image of the House of the Day on their own site ! 2007 ended with a massive 123,293 unique visitors - and a whopping 9 year total of 307,372 unique visitors. More people used CCL in 2007 than in the previous 4 years combined !!!! The site ended with 432 houses in 96 cities in 20 counties across Northern California. We had more press and radio coverage this year than in any previous year, with the HOTD featured on the home page of various Bay Area radio stations and dozens of other websites as well. The 2008 season started later than usual - due to the date of Thanksgiving. Even though the official visitor count only started on November 29th, the first week's trend showed more visitor sessions per day than the previous year at the same time. KGO radio in San Francisco conducted a phone interview with me and it aired on December 3, 2008. Later in the month I was interviewed by KCBS radio, along with Bob Stanley and Bob Widmer (Bob's worlds one and two) of Pleasanton. Several versions of the interview played all day long on the radio. The House of the Day feature continues to be popular, with KKIQ, KKDV, KUIC and KCBS, the San Jose POA, San Francisco POA and Alameda County Sheriff DSA sites also participating this year. The year ended with 200,118 unique visitors for a 10 year total of 507,490. A total of 498 homes in 110 cities / 21 counties were displayed in 2008. The site layout is now wider - to be more in line with today's standards of webpage width, and provide more information. We added a Google™ Mapping feature to the site for all Cities, so you can see the locations of the Properties, and get Directions. The individual house pages now have all images viewable, as well as allow an interactive display of larger size images. We installed a "star rating system", similar to that on Amazon and YouTube. You can now rate the individual houses, which will make the site that much more interactive and fun to use. FreeFind.com provided us with an internal search engine so that you can find houses based on a description. We added Google™ Street View maps on both the Community Routing section and on the individual display / house page. Our Webhost, Infoquest Technologies, moved the site to a newer, faster server - so that you can have a better experience. In 2010 we started with "only" 335 houses (91 cities) and just before Thanksgiving a bit over 49% (164 houses) were confirmed. That is much better than past years at the same time. No significant changes were made to the site this year. The year topped out with about 350 houses / 300 confirmed - a pretty good percentage (86%), but Christmas time, I removed all the houses that had not been confirmed for 2010, thus the total came down to about 315 - 96% confirmed. Alex Dourov was interviewed on KFBK and KGO. 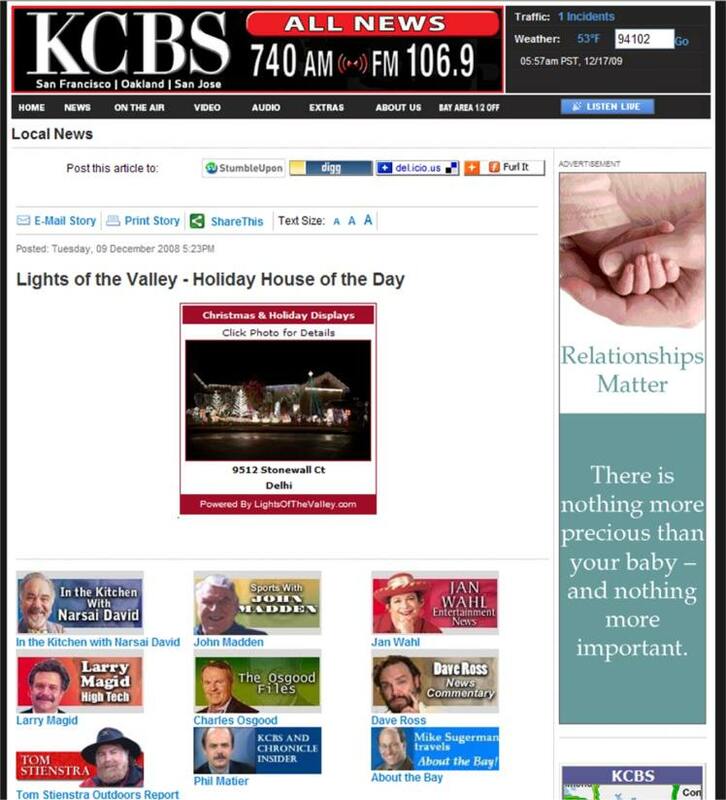 CBS Radio and TV (KCBS and KPIX) posted a homepage article about CCL. The site was featured in Elk Grove, SFGate, City's Best, Pleasanton Weekly, Bay Citizen. The year ended with 163,965 visitors for a total of 932,348 since the site was started. I had hoped to break 1 million this year, but the visitor stats were way down the first couple of weeks. I ended with 340 Houses (328 confirmed), in 94 Cities, in 26 Counties in Northern and Central California. I created a small Facebook presence to which about 60 people became friends or "liked" the site. 2011 started with 487 homes, then dropped to 475 as a number of long time displayers did not plan to have lights this year due to deaths, illnesses or injuries. On the other hand, a number of houses that were "dark" last year came back! The week after Christmas is when I usually spend lots of time scouring every news source in Northern / Central California in my attempt to find more homes to add to the website. Of those 487 homes are about 125 that I found as "potential" homes to list from various newspapers and other sources. This search for new houses to add brought the city total up to 124. We started out with 48% confirmed by Thanksgiving - or 63% of the previous year's listings. I was also able to obtain the domain name of CaliforniaChristmasLights com/net/org/us/ca and this year became the transition year where the site will switch from Lights of the Valley to California Christmas Lights - a more "fitting" name since the site has expanded so much these past 12 years - well beyond "the valley". 2012 was a good year, with over 350 confirmed houses. Probably the best ever in terms of total percentage of confirmed versus total houses submitted. The term "California Christmas Lights" became more universal, though Lights of the Valley is still considered the primary domain. Over 200,000 people used the website - not the highest ever, but still pretty good. We kept promoting the site via Facebook and accomplished over 1,000 likes on the Facebook page. 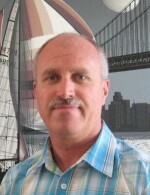 Alex Dourov was interviewed on radio station KFBK again this year, and a number of radio stations ran free promotional announcements about the site. KPIX - CBS 5 of San Francisco used photos from the website almost every day during December as a place to visit and always mentioned or had an image of the California Christmas Lights website during that broadcast. Good Morning Sacramento ran a full length feature on one of the houses in Tracy and mentioned this website several times during that broadcast. 2013 will be a short season - with Thanksgiving being late this year. By November 7th over 20% of the homes were confirmed - that is a good start. I also contacted all the major TV, radio and newspapers throughout the state reminding them about the existence of the CCL website along with a request for promotion, as many of them have done in the past. CCL is now using Google maps V3 for all site pages. It took most of 2 weeks to upgrade it to V3, since the new API is radically different from the V2 API (and the V2 API will no longer be supported by Google). About 35 key site pages were affected (one of which then updates the ~ 115 city pages to use V3). Fortunately we did not "lose" any functionality and in some pages even picked up a few new ones to enhance the map functionality especially the Directions page which can now optimize a route. The one new limitation in V3 is the Directions service now allows a maximum or 10 points. The city pages now include code to advise users of the limit, and prevent going over it. A few days before this year's late Thanksgiving, we already had 52% of the current houses confirmed. This year (luckily) I only had to do snail mail confirmations to less than 10% of the houses. By December 15th, 98.5% of houses were confirmed - a record percentage. Unconfirmed houses were permanently removed to keep the accuracy and relevance of the site as high as possible. The year ended with 352 houses, 118 cities and 34 counties represented in California. In spite of the late starting season, 281,422 unique visitors were logged onto the site, with a record number of 18,342 using the site on December 23, 2013. Other stats: 540 GB of data transferred, 14,858,779 hits with 1,394,607 pageviews. 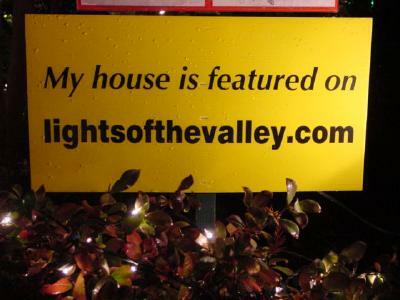 2014 Well, we had yard signs for Lights of the Valley way back in 2001, and I thought it was time to have some new ones made. I used Survey Monkey to survey our display houses on a number of designs and ended up combining three designs into one that seems to 'pop'. Got a great deal from FastSigns in Dublin CA and will sell them at cost to the displayed houses for $10, including postage. Also new this year are Email, Facebook Like and Twitter Tweet functions direct on every listing. So, if you want to share a particular display with others, you can email them, tweet to them or post information directly on Facebook. Virtual Santa seems to be the latest trend. So, now individual listings can have both text and an icon that indicates that they have a Virtual Santa. As well, the Quick View at the bottom of the homepage, and on each community listing now has a function where you can choose to display all listings that have a Virtual Santa display. 57% of homes have checked in by Thanksgiving, the highest percentage that I can recall for this time of year. By December 12th we had already exceeded our allotted bandwidth for the month. Fortunately, my provider, InfoQuest Technologies, sponsors this site's hosting and overage was not an issue. There were several days within the month where total unique users greatly exceeded all previous records. On December 22, 2014 a record high was set with 24,593 unique users on the site that day. It took 13 years to get to our 1 millionth user, and only another 3 years (2012-2014) to get to our 2 millionth user, with 2014 also having the highest number of unique IP addresses/ users in any one year - 408,631. The website was well publicized by print, radio and TV media and was shared on Facebook significantly. 2015 We added a few feature to denote houses that have had an aerial drone video made of their display. Unique visitors for 2015: 386,936. Facebook continued to be the leading method by which the website was publicized and shared. 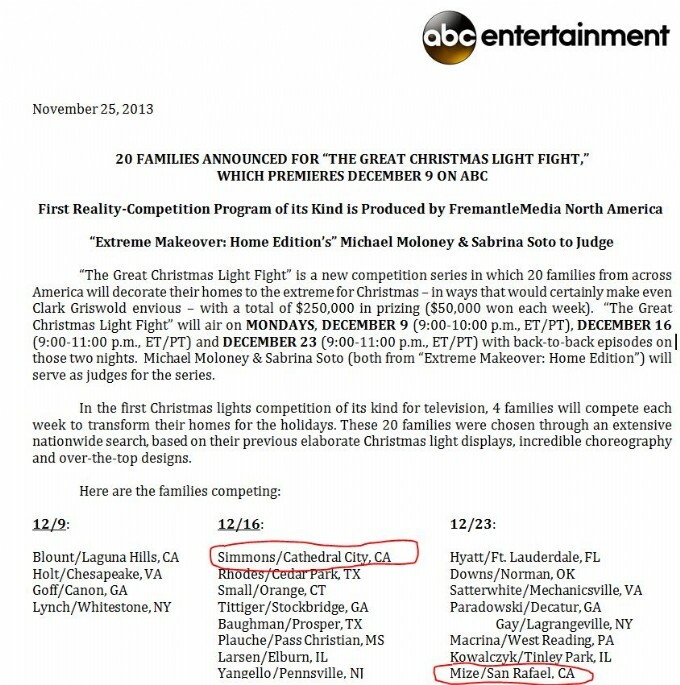 Four houses from the website were on the ABC TV show "The Great Christmas Light Fight": Jack London/Zermatt in Livermore; Chelsea Court in Pleasanton; Oak Ranch in Elk Grove; and Longview Valley in Sherman Oaks. The houses in Livermore and Sherman Oaks each won the grand prize for the episode those houses were on - each winning $50,000. Google Maps has restricted the number of map page views that are allowed at this site due to popularity, and want us to switch to their paid service. We get 25,000 map page views per 24 hour cycle, which is not nearly enough. Towards mid December the mapping service would show an error in the late afternoon as we had run out of the free map views. In an effort to reduce the automatically generated map views on individual listing pages, we created in icon to click on for when you want to see the map. A new record of one day users - 27,861 unique IP addresses logged on 12/24/2017. The site is also on track to break the record for total users in one season (Black Friday to New Years). The site also had a record number of unique users over the season - 552,287. Additionally, the built in search feature was heavily used - with 26,577 searches in the month of December. What originally started out as a “fun thing to do” project became more “spiritual”. I received about 350 emails telling me how valuable the site was to them. What really touched my heart were emails from people who told me it was especially meaningful to the people that are unable to get out and enjoy the lights, they can just enjoy them at home. Year after year, this Web site has been featured in the Tri-Valley Herald, the Contra Costa Valley Times, the Independent News, The Pleasanton Weekly and on radio stations KKIQ, KOIT and KCBS. I can't thank them enough for their support of this "community service" project of mine. I have truly enjoyed myself these past nine Christmas seasons by putting together this site. I was overwhelmed at the kind comments that I have received from many of you telling me how much this site has helped you, or how it even helps "shut-ins" be able to get a virtual tour of the Bay Area's best Christmas light displays. One final note - this site is strictly a "one-man" voluntary, community service operation. It is not a commercial site, I do not charge anything for listings nor do I award prizes of any kind. I decide what houses should be listed - based on my personal tastes - and what I think the community at large will be interested in seeing.